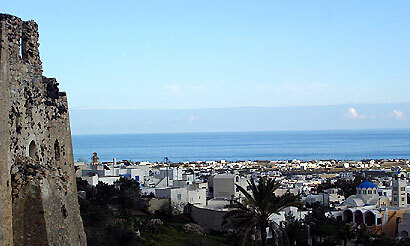 The fortified Tower in Emporio is a square structure in the north part of the village. It was built under the Venetian Rule, probably in the 15th century. 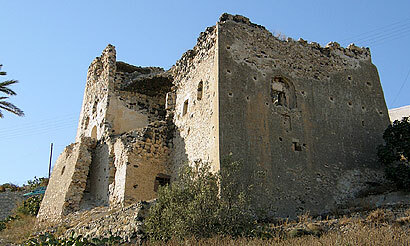 Tradition says that it was built by the monks of the Abbey of Agios Ioannis of Theologou in Patmos. In reality, the tower, as a glebe of Patmos, was first used by the monks some time after its erection. Sources say that it was originally owned by the Dargenta family. There used to be a small chapel within the walls, dedicated to martyr Christodoulos founder of the Abbey of Patmos, as well as a tunnel which led to the 'Kasteli' (castle). SANTORINI WEB PORTALS // Copyright © 2007 Santorini® Web Services. All rights reserved. Copy, reproduction or any kind of use without the written authorization of the rightful owner is prohibited and will be prosecuted.